After trailers for the other anniversary film screenings, Top Secret and Revenge of the Nerds, both celebrating thirty years of laughter, a quick welcome from the aforementioned Sketchfest powers-that-be (by which I mean the fest’s creators David Owen, Cole Stratton, and Janet Varney) served as a kick-off to 2014’s opening night and without much further ado, the lights went down again and Napoleon Dynamite aired as I believe it was meant to: on the big screen, in a theatre full of people laughing every few seconds. At this point, I should admit that while I own and adore the film, I think I’ve previously seen it no more than twice. It’s a very specific, oddball type of humor, and this screening made me realize that, frankly, it’s been too long. This movie is hilarious and yet also oddly endearing: once you get past the overall strangeness of most of the characters, the lives they live, and their fashion choices, it’s a sweet story of friendship with a killer dance routine at its crux. What’s not to love? As expected, there were several moments of raucous applause, especially at Napoleon’s first screen shot, as well as Pedro’s, Kip’s, and that of Uncle Rico. I was surprised to discover how much the crowd loved Napoleon’s interactions with Grandma’s pet llama, Tina. Napoleon’s dance sequence at the rally for class president elections is absolutely the best part of the film, of course. As the scene aired, I somehow managed to suspend my desire to laugh at the hilarity of Jon Heder’s dance prowess; I couldn’t shake the realization that this gesture is the sweetest moment of the movie. Pedro has a tendency to run off and do crazy things like shave his head, thus forcing him to hide from the world until he’s found a way to return relatively unscathed. As he threatens to do the same without having a skit prepared, daunted by Summer’s dazzling performance with her cheerleader friends, Napoleon finds a way to save the day. Not only did he bring down the house, but he redeemed himself in Deb’s eyes, and I don’t care if it momentarily makes this nerdy little high school weirdo my hero…it does. Predictably, the scene drew riotous laughter and applause, and shortly thereafter the film concluded to the amazingly bad When in Rome song, “The Promise.” As the house lights came back up, we were treated to a surprise: Clive Farrington live on stage at the Castro to perform the song. Admittedly, I first thought it was a gag, but it turned out to be fun. Next up was the introduction of moderator Starlee Kine of This American Life. She quickly brought up the highlight of the evening, star Jon Heder. As he took his seat, someone shouted out that she wanted to have his baby. Without missing a beat, Jon retorted, “you can’t have my baby!” He unscrewed the cap from a bottle of water before he said another word, drinking from it just as Napoleon does from his Gatorade bottle while he’s “practicing” his dance moves. Naturally, this drew a big laugh and got the discussion/Q&A portion of the evening underway. Before taking questions from the audience, Jon and Starlee chatted about the film. Jon said that part of what makes it so funny is that the “characters themselves are jokes,” noting that the film is full of “weird stuff,” and that the commitment to creating this “contained world” where weird characters’ lives mix and mingle worked because everyone was so commited one-hundred-percent of the time to their characters. He also noted that without a studio backing the film, production had been “financially limited but free” and creatively unlimited, without temptation to add little bits of CGI here and there or other such bigger-budget options. Jon spoke about having had nothing to lose, being a “poor college student” at the time he was asked to do the film. “Who’d say no to that? !” He had no preconceptions about fame, he said; he wasn’t worried about what it would do to his career. “What career? !” It helped, Heder said, not having any ego to bring to the table, or any concerns about the film’s outcome. 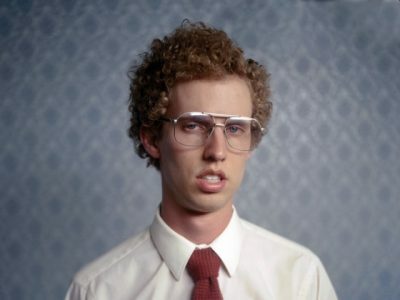 “It totally helped us get into character and stay focused.” What I didn’t know until that night is that the character of Napoleon Dynamite was established in a short film called Peluca, “about a year and a half” before the feature film. When asked about his decision to perm his hair for the role, Heder said he “thought about it for about a day.” He was in college, he said, “I was unmarried, trying to score chicks… why not? This is gonna be awesome!” Ironically, he admitted that he “scored his wife” while he had the Napoleon perm. He went on to describe its growing-out stages before moving on to discuss the film as a whole. “I haven’t seen it in a while! I’m wondering if I should introduce my kids to it.” At a local screening, he remembered, “the high school kids didn’t really get it. They were excited to meet someone who was in a film, but they mostly appreciated the physical humor: they laughed every time he fell, stuff like that.” Interestingly, (sadly?) the high school kids started to get on board when MTV showed interest in the project, thus making it “cool.” What’s perhaps more note-worthy is that Heder said “little kids get it.” He never can seem to get “who introduced it to who” in family situations: was it grandma who showed it to the kids, or the other way around? When asked about being recognized in public, Heder admitted “it’s the voice” that gives him away. Kine suggested “you look better now – you’re cuter!” and there was a brief moment of play-flirting between them as they stretched to fake a little footsie before taking a few quick questions from the crowd. First, someone asked how long Heder rehearsed the dance. I was surprised to learn that it was unrehearsed: Heder just free-styled. “I liked to dance.” At the audience’s unrelenting insistence, he got up to bust a few moves for us, which was one of the best parts of the night. “I liked to dance in college – not high school.” He went on to describe that “after a good shower,” he liked to dance around with all the mirrors, and that he really did enjoy breaking it down to Jamiroquai (which really was the song he was dancing to in those three takes). Filmmaker Jared Hess’ wife heard about Heder’s love for dancing, and his little dance segment from Peluca was cut from the film. When told that Hess wanted him to dance for Napoleon and that it would be the climax of the film, Heder didn’t bother with choreography: instead he just asked them to “throw on some MJ or some Jamiroquai” and it was just three takes “until I was basically puking my guts out.” Editing those three routines until they had the best possible sequence, movie magic was created. The next question asked about Heder’s relationships with other cast members. He explained that aside from himself and Aaron Ruell (Kip), everyone else involved in the film was either auditioned and hired from LA or an actual resident of Preston. Heder and Ruell were film students at BYU who were “out of our element,” but there were “no egos,” no crazy requests for big fancy trailers; “we were like family, it was fun.” Heder briefly mentioned the fun it had been to get the cast back together for the animated TV show version, for which a few people applauded. “It was for those two people,” Heder joked. “They saw it. It was like a reunion, the first time all the cast got back together. It was amazing.” They still keep in touch, Heder says, and they’re all great. Asked about the scene where Gries threw a steak at Heder’s face, he admitted that it took “a lot of takes.” Everyone kept lobbing steaks at his head – “the director, the prop guy,” but nobody could hit him. Finally, Gries himself took the steak, overhanded it toward Heder, and “that’s the one that got me.” He admitted that it hit him so hard that he was hurt, but he tried desperately not to break character, because “I knew that was the shot.” Indeed, it was an awesome take. This is how all movies should be watched. I don’t have much more to say about it than that, except that it was a treat to watch the film again, and especially to hear Jon Heder’s funny, candid replies to some great questions, and I really enjoyed watching him “do Napoleon” live, as he easily slips in and out of character. Both are fun to watch, and I hope if we get to do it all over again in five or ten years that I’ll get to be in the crowd that night, too.